For our game we will need to add physics to keep our hero firmly on the ground. This will set the strength and direction of the gravity and stops the physics being applied when objects settle. Our gravity will be pretty strong at 2400. The type is box and that means the collision area is a box shape surrounding the object. The part is also set to solid. That means that the object will not be able to pass through other solid body parts. Run that and you'll see our hero fall right through the floor. So that's good. The physics body is working. But we need to get the platforms solid too. Notice the slight difference from the HeroBody? The PlatformBody is not dynamic, so it won't be affected by gravity. But the PlatformBodyPart is set to solid. 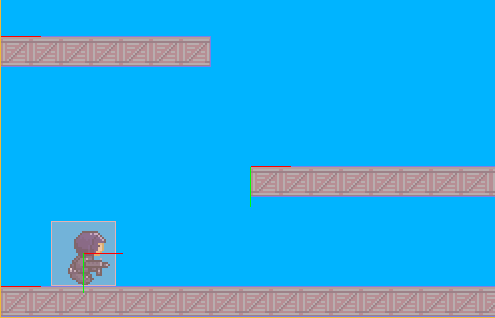 This will allow the hero to collide with the platform without it falling away. But the two won't affect each other until you set collision flags. The SelfFlags property is a string that describes the object and the CheckMask is a mask list of other object self flags it can collide with. So both objects are set to collide with each other. Run the game and our hero will land and stay on the floor. Our guy lands and stays on the floor. Good. You can see the boxes that surround the hero and platforms. That is because they have bodies. Much better. Don't forget to turn off the physics debugging before continuing. Next, Part 10 - Input Controls.